Try Something New: Free Printable! Lately I've been changing things up in my daily routine. I've been learning to get out of my comfort zone by literally trying something new. Whether it be a new way to do something I've always done, or by doing something that I haven't done before. By changing things up a little -- bigger changes get presented and then possibly some real big changes behind that. I've created this free 8x10 printable for your viewing pleasure. Feel free to print off and frame or pin to your handy dandy cork board. Click here for full size! For personal use only. Please credit and not to be sold. 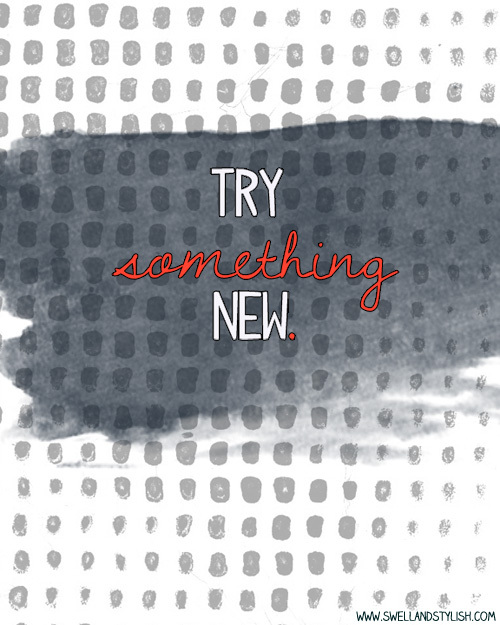 Have you tried something new lately? What type of things do you do when you want something new in your routine? I'd love to hear about it! Aw, thanks lady! I love recipe hunting too, although I usually don't have all the ingredients when I find a good one. Nice!! What a cute blog!! Love it!